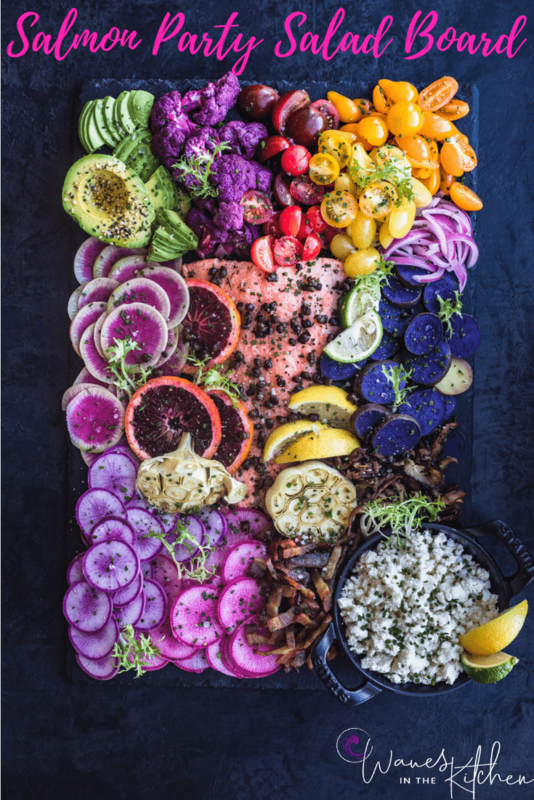 A perfectly moist piece of salmon is surrounded by all sorts of fresh and seasonal goodies, ranging in textures and flavors, creating a very vibrantly nourishing salmon rainbow party salad board! 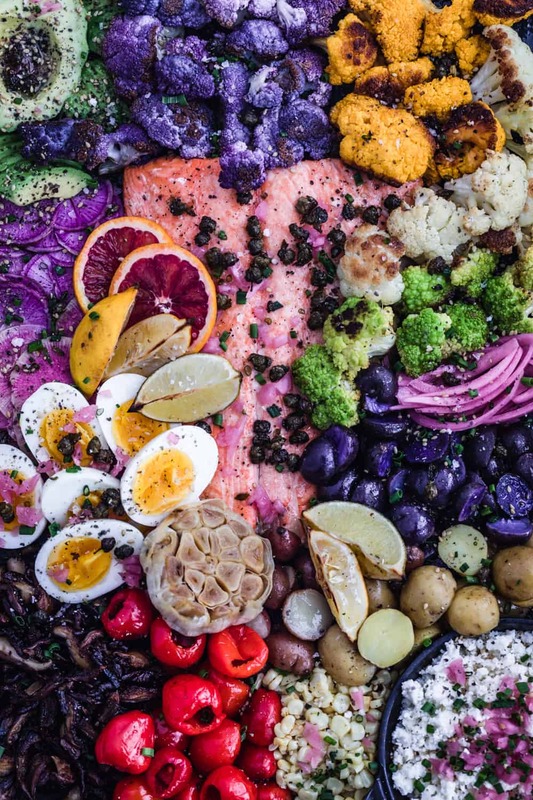 It’s a pick-whatcha-want-from-the-platter-and-build-your -very-own-salmon-salad-adventure situation. It’s the dish that’s been missing from all your dinner parties that you never even knew existed! Fail-proof: slowly roasting the salmon makes it nearly impossible to overcook and the result is a tender and moist fish. The salad is versatile and easily adaptable to every season of the year so we can enjoy this party platter year round! This dish can be as quick to make as you want it to be! It all depends on the toppings you choose. 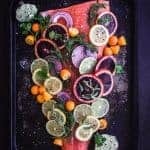 This salmon dish falls in the magic intersection of looks highly impressive and is super easy to make! Prepping the other ingredients and making the vinaigrette while the salmon is baking is an efficient way to whip this meal up in no time. So hear me out y’all! 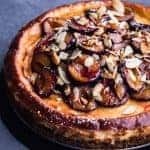 I wanna call this post an *idea* rather than a recipe. 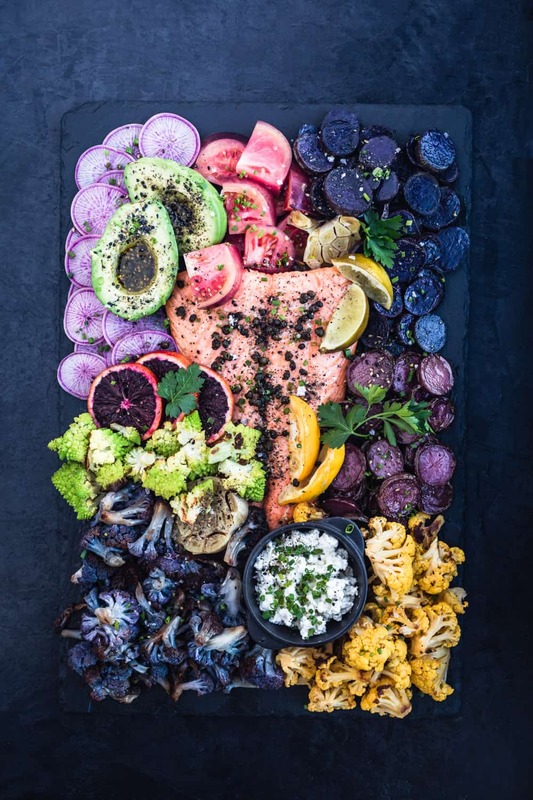 The idea goes like this: cook a piece of salmon, put it on a large board, and surround it by all sorts of fresh and seasonal goodies. Make a vinaigrette and serve the salmon board with a bowl of greens and vinaigrette. 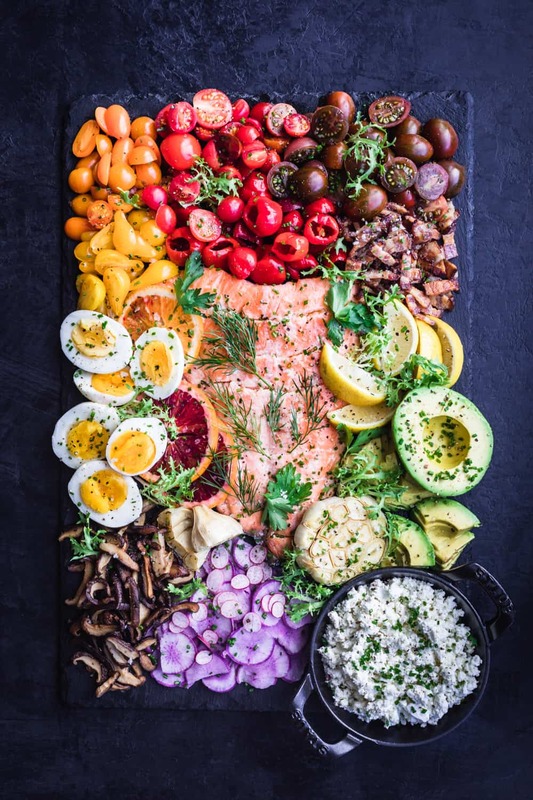 In terms of goodies to surround the salmon with, think all sorts of produce, bacon (or other charcuterie), cheeses, eggs, olives, alliums, nuts…. but mostly seasonal and local produce. So I don’t wanna be all bossy here and tell ya exactly what to surround the salmon with! Especially cause I’ve made a ton of rainbowlicious variations and they’re all winners! That’s why I’m calling this dish an idea instead of a recipe. Ya dig?!?! 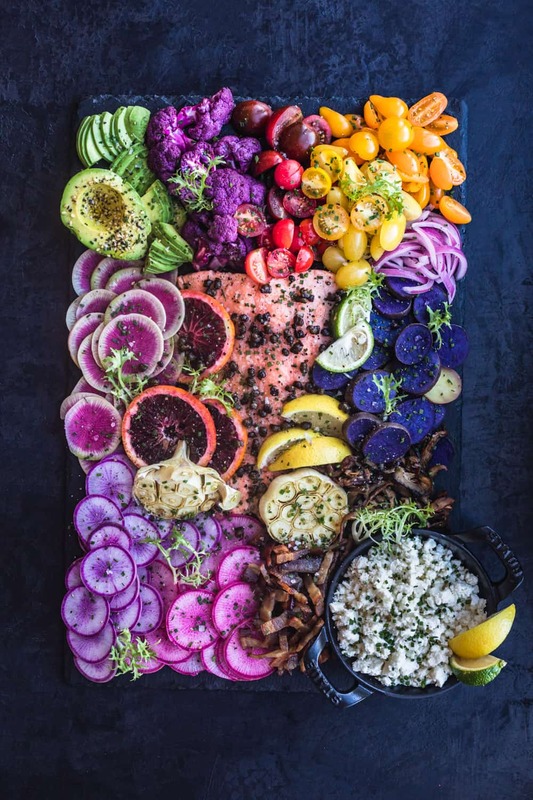 Instead of giving ya an exact blueprint to replicate, I’m gonna show ya all sorts of stellar variations on of this Salmon Rainbow Party Salad Board below. And for all of you that do strongly desire a recipe to follow, I’ll still be sharing one below so no worries, I gotcha covered too. Use what’s local and seasonal to surround the salmon with! And that will change with the seasons. Since first discovering this Salmon Cobb Salad I’ve been quasi-obsessed making some version of it at my dinner parties. And what I surround the salmon with changes with the seasons…. and my mood. If it will taste good in a salmon salad, it can go on this board I say! 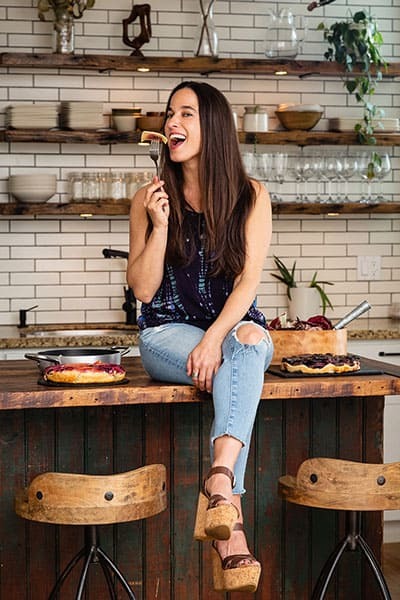 I host dinner parties quite frequently, for people to meet, mingle, eat good food, have a grand ol’ time and build community. There’s something about interactive food that’s spectacularly conducive to building community. I love it when my guests have gotta get all up in there, perhaps even using their hands, choosing what to put on their plates and hearing people asking what combo others got going on. I often serve the platter as the finger food app, arranging it on my coffee table in my living room moments before guests arrive. 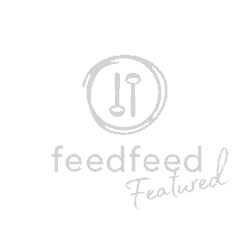 It has a WOW factor to it and is a dish that fosters community building! When possible, buy wild salmon! For all the goodies surrounding the salmon, think fresh, local, and seasonal. Serving size can easily vary depending on the number of people you’re cooking for. Leave the skin on the salmon and bake skin-side down. Check you salmon: Cooking time for salmon will vary depending on the thickness of your filet. Vinaigrette can be made up to 3 days ahead and refrigerated; let come to room temperature before serving. Heat 2 tablespoons of olive in a small saucepan over medium-high heat. Add the capers and cook, swirling pan occasionally, until capers burst and are crisp, about 5 minutes. Transfer capers with a slotted spoon to paper towels to drain. Let oil cool; set aside. Rub salmon all over with reserved caper oil and place skin side down on a baking sheet; season generously with salt and pepper. Arrange garlic bulb halves around salmon and drizzle with 1 tablespoon more of oil. Bake for about 15-25min, until the salmon is barely cooked through and just opaque on the inside. Exact timing will vary depending on thickness of cut, check every 10 minutes until it’s done. My pieces usually take around 20 min. For the shiitakes mushrooms: heat a skillet over medium-high heat until very hot. Swirl ¼ cup of olive oil. Add mushrooms and spread in a single layer. Flip/stir every 3-5 minutes for about 15-20 minutes, until they’re nicely charred and browned all over. Don’t over-stir to allow the mushrooms to be well seared. For the potatoes: Put potatoes in a Dutch oven, cover with water, season generously with salt and heat over medium-high heat until boiling. Lower heat to a gentle simmer and cook until potatoes can be pierced with a fork with no resistance, about 10 minutes. Let cool and drain. I sometimes only par-boil my potatoes and finish them in a 450 F oven with olive oil. This is optional. For Cauliflower: Pan Sear or Bake. To Pan Sear: heat a skillet over medium-high heat until very hot. Swirl ¼ cup of olive oil. Add cauliflower and let cook, undisturbed, until deep golden on one side, about 5 minutes. Flip cauliflower and cook, stirring cauliflower as necessary, until its nicely browned all over, about 5-6 minutes more. Remove from pan and set aside. To Bake: toss with ¼ cup of olive oil and roast in an oven at 450 F until tender and browned, about 35min. Set aside. 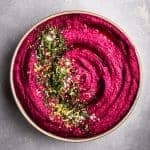 For the tarragon vinaigrette: Using an immersion blender or standing blender, blend cider vinegar, honey, shallot, Dijon mustard, tarragon, and a large pinch of salt until well combined and tarragon and shallot are finely chopped. Transfer to a mixing bowl and whisk in remaining 1 cup olive oil. Season with salt, if needed. 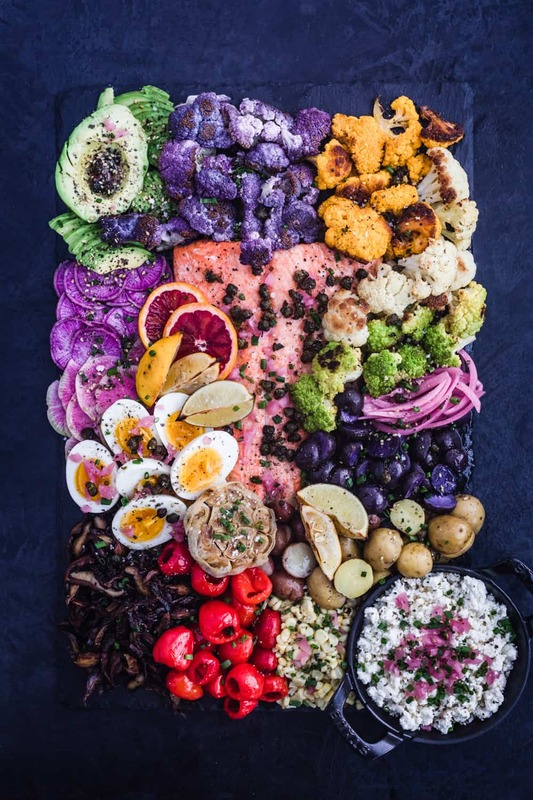 Place salmon on the center of the board and surround with all your toppings. Sprinkle the fried capers and fresh herbs on top. Serve alongside the bowl of greens and vinaigrette. Enjoy! For all the goodies surrounding the salmon, think fresh, local and seasonal. Check you salmon: Cooking time for salmon with vary depending on the thickness of your filet. You are too cute Jacqueline! Thank ya so much! And it was such a pleasure to serve this to ya at a past pop up! Cant wait to have you over again :). WOW, this is super colourful. So many textures too. 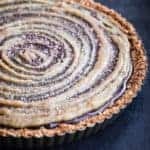 What a great recipe for entertaining with. I think the guests would be totally impressed. Thank ya so much Gloria! That’s definitely the idea! And yes it absolutely positively WOWS guests when they walk in! Such a fun dish to serve for entertaining. Thanks so much for the super sweet feedback :). 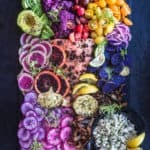 This is the most gorgeous and colorful salad board I have ever seen! FOR sure this would impress your guests that you were serving it to. Thank you for sharing a beautiful and delicious idea! Thank you Denise for the super sweet feedback! 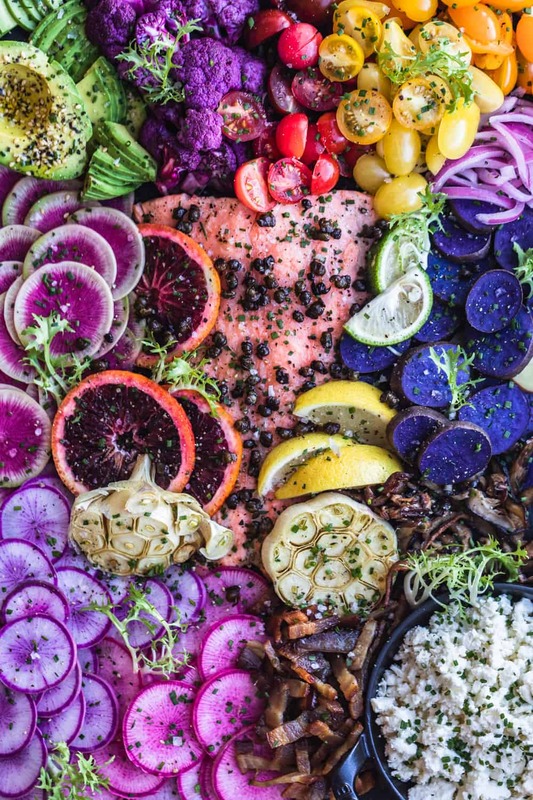 Wowie the most gorgeous and colorful salad board you’ve ever seen :)???? You just made my whole entire day!!! Thank ya so much! And yes it absolutely positively impresses guests! Thanks so much for the kind feedback Analida ~ I really appreciate it! Yes the salmon is super moist and juicy :). Oh my these colors are just unreal!!! Yes slow roasting is always ideal with salmon. Can’t wait to make this one! So stoked to hear that Lorie!!! Thank ya so very much! And of course I agree on slow roasting :). Please let me know how it goes after ya make it… I’d absolutely love to hear! Hehehe… thank ya Jo! I’m all about sensational salads… bet I could make ’em so you’d eat 3 a day :)! Really appreciate the sweet feedback too ~ thank ya! Ok. This is just. Friggin. Gorgeous. And serving this at a dinner party would steal the show. So pretty! Thanks for the tip on how to cook the salmon too! Absolute pleasure Heather! And thank you for the super sweet feedback! This is def a show stealer at a dinner party ~ I know from much experience :). And it’s so easy to make! Hope ya make it soon too! Thanks so much Cathleen! What does your salmon look like? Really appreciate the sweet feedback and def do make this next time ya have friends over! And let me know how it goes ~ I’d absolutely love to hear :). Oh wow!!! This is so beautiful I absolutely love the colors and the flavors. I must make this next time I’m throwing a party. My guests will be so surprised. Yes they will be Natalie!!! Def let me know how it goes ~ I’d absolutely love to hear :). I’m all about super colorful food! This is such a beautiful assortment ! I love the beautiful vivid colors. This looks like a great summer time platter ! Thanks smooch Analida! I’m all about vibrantly colorful food! Really appreciate the feedback :). Wow wow wow! You can eat a rainbow too. Such a gorgeous and nutritious meal here, a stunner meal. That’s exactly the idea Jagruti!!! A rainbow a day keeps the doctor away I say :). Thanks so much for the super sweet feedback! Really appreciate it!